Despite the fact that the constitution spells out equal rights for men and women in India, Indian women continue to encounter abuse. According to the National Crime Records Bureau of India, a crime against a woman is committed every three minutes, and 65 percent of Indian men believe women should tolerate violence to keep the family together, and that women sometimes deserve to be beaten. With the increasing number of Christian converts in Central India, local Hindus are often very hostile toward Christians who left Hinduism for Christianity. They believe that people from Western countries offer money to anyone who converts to Christianity. When Sarita met and married Mohan*, she never thought she would be one of the millions of women in India throughout the world who live in fear of their husbands. And she had no inkling she’d wind up enduring 13 years of abuse for her faith–eventually raising her children as a single parent. Sarita* and her two children, Ashish* and Asha*. She lives in a small town in Central India and now faces raising her two children, her 12-year-old mentally challenged daughter Asha* and 8-year-old son Ashish*, alone. Sarita first heard about Jesus 16 years ago from her Christian friends. Slowly, she realized Christ’s love and gave her life to God. After she completed her studies, she fell in love with a Mohan, a Hindu man, and married him. 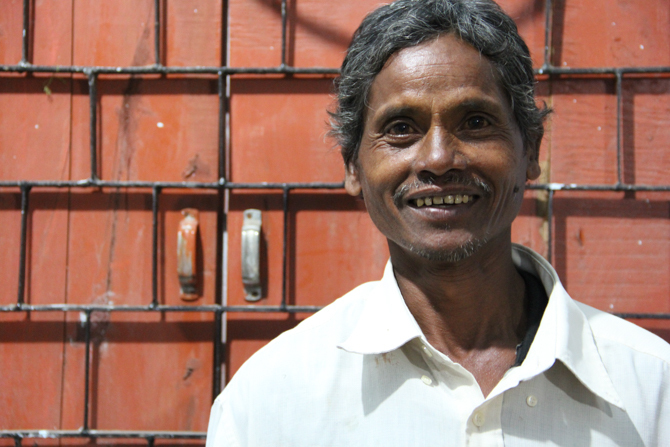 Initially, Mohan expressed willingness to accept his new wife’s Christian faith. But after a few months of marriage, he began to change. “Everything seemed fine until our sixth month of marriage. After that my husband began physically abusing me,” Sarita says quietly. “He would come home drunk, beat me, and say that my faith was a shame to his family. Sarita was still trying to cope with the abusive situation when she stumbled upon a horrific secret. Her husband had been married before and even had three children with his first wife. But like many women throughout India in abusive situations, Sarita couldn’t even think about leaving her husband and getting out. She was pregnant with their first child and had nowhere to go, no one to turn to. Her relatives abandoned her when she made the decision to believe differently than them and trust Christ. Mohan continued to physically abuse his pregnant wife–abuse that would eventually damage the baby in her womb. Asha was born with birth defects, leaving her mentally challenged. She suffers from seizures. Sarita thinks back to the nightmarish scenes and shares candidly: “My husband would beat me with his shoes (a cultural sign of disrespect) and anything he could get his hands on. My body was always full of bruises. “I prayed that God would work in his life and change him,” she says through tears. Four years later, she gave birth to a healthy baby boy. At the same time, life was becoming more and more unbearable. Her daughter required regular medication. The medical costs were extremely high–causing her husband to become even more upset and abusive. “He would often only give money for half of the medicines,” she says. Despite the challenges, Sarita continued living with and praying for her husband. “I prayed night and day; it was difficult, but God gave me strength,” she says. After repeated physical and mental abuse, Mohan left her last December 2017 and went to live with his first wife. The persecution then went from private to public. And from suffering in seclusion to living in social disgrace. Mohan further abused his wife by publishing a false news report about Sarita in the local newspaper. In it, he called her a prostitute–publically defaming her. In the midst of everything, Asha grew very ill, very close to death. She suffered continued seizures and eventually was hospitalized in the ICU. “I had no money to pay the bills. My husband would not help. Open Doors came to my rescue and helped me pay the bills,” she says. Sarita’s daughter is better now but requires constant care. And there is no one to provide for the family. “I could work because I am educated, but my daughter needs care. She cannot do a thing without me,” Sarita says. She and her children often receive food and financial help from local church members. Pressed from all sides, Sarita hasn’t failed to see God’s hand leading her and supporting her. Her church members also encourage her and she moves on. Sarita would continue to feel God’s presence in her life, through people He places in her life, Scripture, her prayers and her church. Sarita’s daughter, Asha, would be healed. Pray that she and Ashish would learn to trust in God’s plan for their lives. Mohan would meet Christ and be convicted of his responsibility as a father to care for his children. Christian women throughout Central India in abusive situations would seek help. Pray that God would change hearts and surround them with His protection and comfort. Sign up to get prayer updates like this about persecution in India and Christian Persecution around the world.